Background: Āmalaki (Embelica officinalis Gaertn.) is one of the most celebrated herbs in the Indian system of traditional medicine. It is one of the best Rasāyana-s (health promoting) drug. In Dugdhāmalakyādi yoga, Āmalaki (Embelica officinalis Gaertn.) powder is administered along with milk in case of svarabhaṅga (hoarseness of voice). Here an attempt is made to convert this formulation into chewable tablet without altering its property to improve its palatability, shelf life and fixation of proper therapeutic dose. Methodology: Chewable tablets were prepared by wet granulation method. Here, Āmalaki powder was prepared initially and it was mixed with additives and preservatives. Granules were prepared from this mixture by adding binding agent, finally compressed in to tablets. Results and Conclusion: The physico-chemical analysis of Āmalaki standard are: Foreign Matter-Nil, Acid insoluble Ash-0.51%w/w, Water soluble Ash-2.01% w/w, Alcoholic Extractives-44.48%, Aqueous Extractives 67.52%, pH-3.1, Moisture content-8.19%. 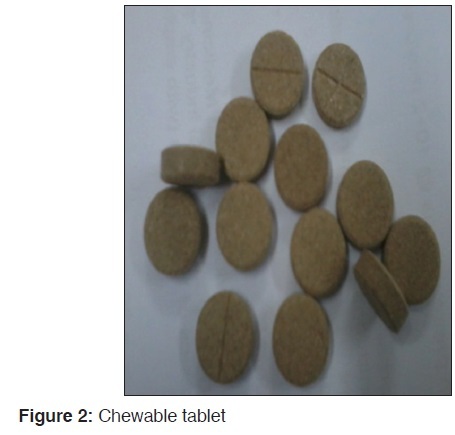 Quality control test for chewable tablet was carried out and found satisfactory with general characteristics of tablet viz. hardness 1.8, disintegration time 15-20 min, friability 0.5%, weight variation +/- 3%. The TLC of Āmalaki powder showed 3 spots with Rf value 0.14, 0.4, and 0.73 and the chewable tablets showed 2 spots with Rf value 0.31 and 0.89 under 254 nm. The adaptation of modern techniques or methods to convert the Ayurvedic formulations without altering its therapeutic property is necessary to made them suitable for the present trends of newer drug delivery dosage forms. Āmalaki (Emblica officinalis Gaertn.) belongs to family Euphorbiaceae ascending to 1300 m on hills, abundantly available throughout India. The proven pharmacological properties of Amalaki are imunomodulatory activity, antipyretic and analgesic activity, hepatoprotective activity, cytoprotective activity, antitussive activity, gastoprotective activity, ophthalmic disorder, antibacterial activity, radioprotective activity, chemopreventive activity, antitumor activity, antiulcer activity, hypocholesterolemic activity, hypolipidemic activity, antimutagenic activity, antioxidant activity, anticancer activity, antiproliferative activity. There are many formulations explained in classics having Emblica officinalis Gaertn. as main ingredient. Although they are potent enough in treatment, they are not stable for longer duration due to their plant origin and as they are organic in nature they easily deteriorates with microbial contamination. Among those Dugdhamalakyadi Yoga is one important plant based preparation in which Amalaki (Emblica officinalis Gaertn.) 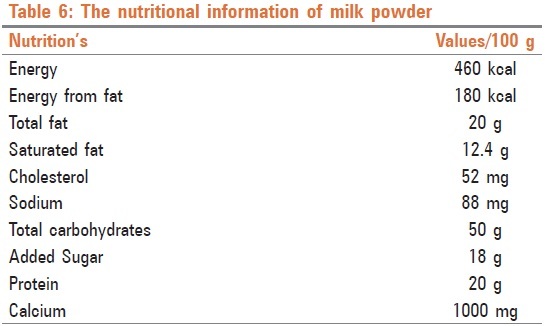 powder [Figure 1] is administered along with milk in case of swarabhanga (hoarseness of voice). To improve its shelf life, palatability and for the proper fixation of therapeutic dose, it is current essential requirement to develop Dugdhamalakyadi Yoga into chewable tablet [Figure 2] form along with its quality analysis as per standards. Emblica officinalis Gaertn. was collected from the Western Ghats of Belgaum region in winter season as per mentioned in Ayurvedic classics and authenticated by AYUSH approved drug testing laboratory, KLEU'S BMK Ayurveda Mahavidyalaya, Belgaum. Amulya milk powder was purchased from Gujarat co-operative milk marketing federation limited. The Poly vinyl pyrrolidone (PVP), Ethyl alcohol, Talc, cross caramellose sodiums were purchased from S.D.Fine Chem, Ltd. Mumbai. Methyl paraben, propyl paraben and Sucrose purchased from the local market. The study has been conducted in KLEU'S Ayurveda Pharmacy, Belgaum. Completely dried fruit pulp of Emblica officinalis Gaertn. was powdered in pulveriser and passed through 100 # sieve, powder was collected in a clean air tight jar. The prepared powder is subjected for preparation of chewable tablet by wet granulation method by using non aqueous solution. Known quantity of powder is weighed according to the number of tablets to be compressed. Powder and other excipients are taken in a mortar and converted into a dough mass by adding required quantity of 10% PVP in ethanol as a granulating agent. The dough mass is passed through sieve number 10, the pallets obtained are dried in a tray drier at 60°c for 15 min. The dry granules are passed through sieve number 44, super imposed on sieve number 22 on a clean filter paper. 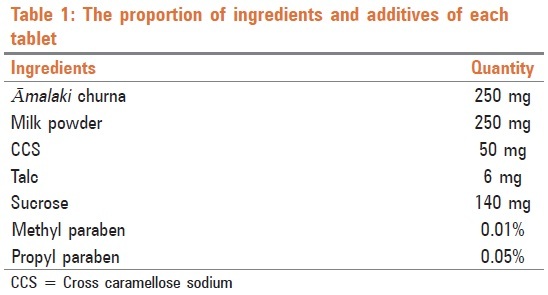 The granules retained on sieve number 44 are collected and to this 10% of fines, the remaining quantity of sweetening agent, preservatives and suitable quantity of lubricant was added, mixed thoroughly and compressed into tablets., The quantity of ingredients is as shown in the table [Table 1]. 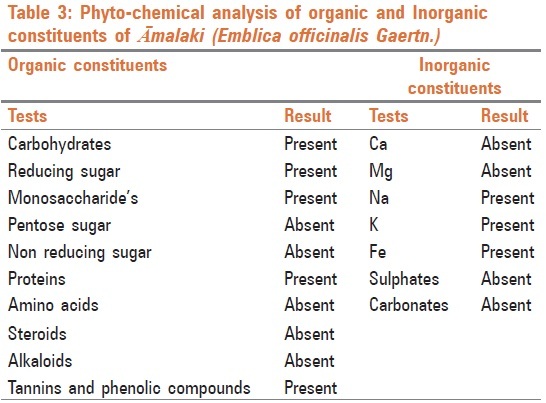 Physico-chemical and Phyto-chemical analytical results of powder of Emblica officinalis Gaertn were compared with the standards of IP, it showed with in normal limits [Table 2] and [Table 3]. 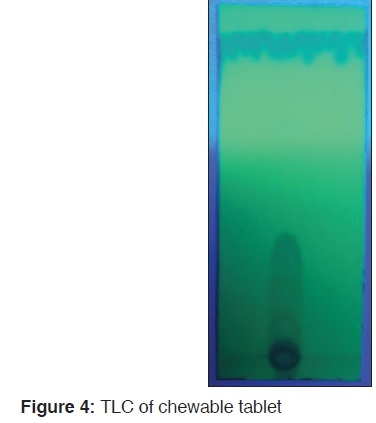 The analysis of chewable tablet were showed the satisfactory results [Table 4]. And organoleptic characters of both powder and tablet also done [Table 5]. In Dugdhāmalakyādi Yoga, powder of Emblica officinalis Gaertn. is administered along with milk in case of svarabhaṅga (hoarseness of voice). Here is an attempt made to develop this formulation into chewable tablets by wet granulation method by adding milk powder instead of milk, by this the property of the milk also mixed with the tablets [Table 6] and other additives also added to improve the stability of this tablet. The preliminary phytochemical analysis of Emblica officinalis Gaertn. has shown presence of reducing sugar, monosaccharide's, proteins, tannins, sodium, potassium and Iron. The organoleptic characters and analysis of (Emblica officinalis Gaertn.) chewable tablets are sweet in taste because of adding sweetening agent to increase palatability, light brown in colour. Hardness is 1.8, so it can be chewed without any difficulty, Friability is 0.5% helps to carry easily with less percentage of breakage. Disintegration time 15-20 min can dissolve easily in mouth. Weight variation is ± 3% by this proper fixation of therapeutic dose can be achieved. The TLC of powder of Emblica officinalis Gaertn. was developed in ethyl acetate and toluene in ratio 1:9 v/v solvent system. Under 254 nm it showed 3 spots with Rf value 0.14, 0.4, and 0.73 [Figure 3] and the chewable tablets showed 2 spots with Rf value 0.31 and 0.89 [Figure 4]. Solvent system used: Ethyl acetate and toluene (1:9). No of spots: Powder of Emblica officinalis Gaertn - 3 spots. Chewable tabletof Emblica officinalis Gaertn - 2 spots. 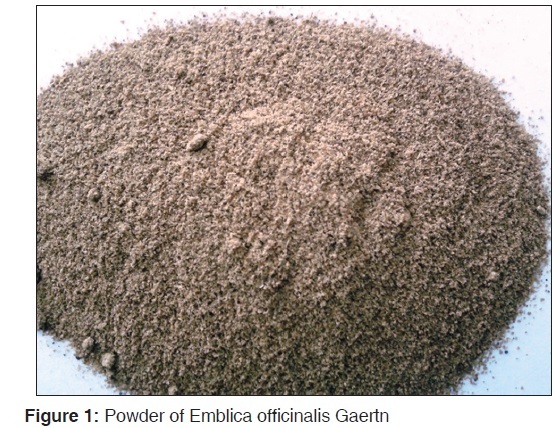 Rf values: Powder of Emblica officinalis Gaertn -0.14, 0.4, and 0.73. Chewable tablet of Emblica officinalis Gaertn -0.31 and 0.89. The TLC studies give an idea of presence of constituents of initial drugs in final product. TLC of churna was compared with CT. Spots obtained in powder were near with those in the chewable tablets. Spots with similar or close Rf values in the finished product may be due to identical compounds and these spots confirm the presence of genuine ingredients in the finished product. The spots missing in chewable tablets may be due to presence of additives and process effect. The adaptation of modern techniques or methods to convert the Ayurvedic formulations without altering its therapeutic property is necessary to made them suitable for the present trends of newer drug delivery dosage forms. 1. Bhavamishra. Haritakyadivarga. In: Dr. K.C. Chunekar, Translator. Bhavaprakasha Nighantu, Reprint. Varanasi: Chaukhambhabharati academy; 2004. p. 10-2. 2. Srikumar R, Jeya Parthasarathy N, Sheela Devi R. Immunomodulatory activity of triphala on neutrophil functions. Biol Pharm Bull 2005;28:1398-403. 3. Perianayagam JB, Sharma SK, Joseph A, Christina AJ. Evaluation of anti-pyretic and analgesic activity of Emblica, Officinalis Gaertn. J Ethnopharmacol 2004;95:83-5. 4. Bhattacharya A, Kumar M, Ghosal S, Bhattacharya SK. Effect of bioactive tannoid principles of Emblicaofficinalis on iron-induced hepatic toxicity in rats. Phytomedicine 2000;7:173-5. 5. Sai Ram M, Neetu D, Deepti P, Vandana M, Ilavazhagan G, Kumar D, et al. Cytoprotective activity of Amla (Emblica officinalis) against chromium (VI) induced oxidative injury in murine macrophages. Phytother Res 2003;17:430-3. 6. Nosál'ová G, Mokrý J, Hassan KM. 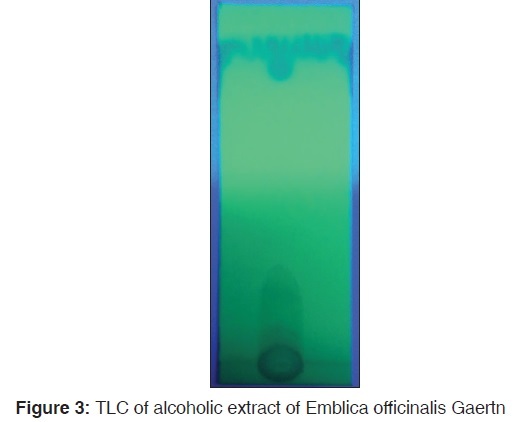 Antitussive activity of the fruit extract of Emblica officinalis Gaertn. (Euphorbiaceae). Phytomedicine 2003;10:583-9. 7. Al-Rehaily AJ, Al-Howiriny TA, Al-Sohaibani MO, Rafatullah S. Gastroprotective effects of 'Amla'Emblicaofficinalis on in vivo test models in rats. Phytomedicine 2002;9:515-22. 8. Biswas NR, Gupta SK, Das GK, Kumar N, Mongre PK, Haldar D, et al. Evaluation of Ophthacare eye drops: A herbal formulation in the management of various ophthalmic disorders. Phytother Res 2001;15:618-20. 9. Srikumar R, Parthasarathy NJ, Shankar EM, Manikandan S, Vijayakumar R, Thangaraj R, et al. Evaluation of the growth inhibitory activities of Triphala against common bacterial isolates from HIV infected patients. Phytother Res 2007;21:476-80. 10. Singh I, Sharma A, Nunia V, Goyal PK. Radioprotection of Swiss albino mice by Emblica officinalis. Phytother Res 2005;19:444-6. 11. Sancheti G, Jindal A, Kumari R, Goyal PK. Chemopreventive action of Emblicaofficinalis on skin carcinogenesis in mice. Asian Pac J Cancer Prev 2005;6:197-201. 12. Jose JK, Kuttan G, Kuttan R. Antitumour activity of Emblicaofficinalis. J Ethnopharmacol 2001;75:65-9. 13. Sairam K, Rao CV, Babu MD, Kumar KV, Agrawal VK, Goel RK. Antiulcerogenic effect of methanolic extract of Emblicaofficinalis: An experimental study. J Ethnopharmacol 2002;82:1-9. 14. Kim HJ, Yokozawa T, Kim HY, Tohda C, Rao TP, Juneja LR. Influence of amla (EmblicaofficinalisGaertn.) on hypercholesterolemia and lipid peroxidation in cholesterol-fed rats. J Nutr Sci Vitaminol (Tokyo) 2005;51:413-8. 15. Saravanan S, Srikumar R, Manikandan S, JeyaParthasarathy N, Sheela Devi R. Hypolipidemic effect of triphala in experimentally induced hypercholesteremic rats. Yakugaku Zasshi 2007;127:385-8. 16. Kaur S, Arora S, Kaur K, Kumar S. The in vitro antimutagenic activity of Triphala - An Indian herbal drug. Food ChemToxicol 2002;40:527-34. 17. Bafna PA, Balaraman R. Antioxidant activity of DHC-1, an herbal formulation, in experimentally-induced cardiac and renal damage. Phytother Res 2005;19:216-21. 18. Rajeshkumar NV, Pillai MR, Kuttan R. Induction of apoptosis in mouse and human carcinoma cell lines by Emblicaofficinalis polyphenols and its effect on chemical carcinogenesis. J Exp Clin Cancer Res 2003;22:201-12. 19. Zhang YJ, Nagao T, Tanaka T, Yang CR, Okabe H, Kouno I. Antiproliferative activity of the main constituents from Phyllanthusemblica. Biol Pharm Bull 2004;27:251-5. 20. Shah. RNC. Bharat Bhaishajya Ratnakar. Delhi: Motilal Banarasidas; 1985. p. 13. 21. Mehta RM. Processing of tablets. Pharmaceutics-I. 5 th ed. Delhi: Vallabha Prakashana; 2010. p. 248. 22. Mehta RM. Processing of tablets. Pharmaceutics-I. 5 th ed. Delhi: Vallabha Prakashana; 2010. p. 251-2.